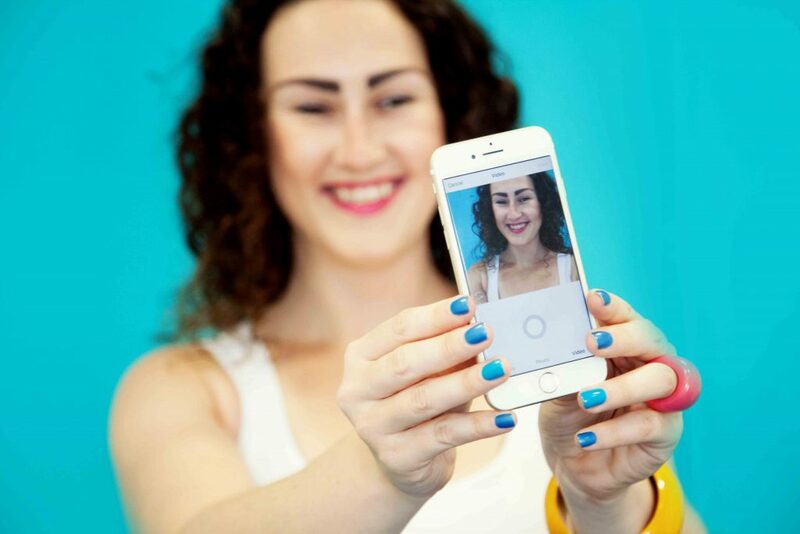 Ready to step up your Instagram for business game? 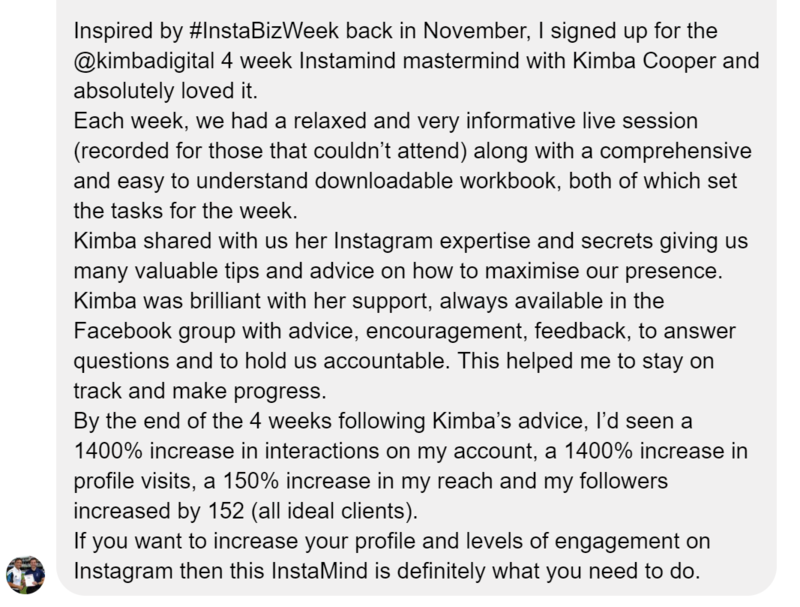 In this five week online, interactive mastermind, I’ll share all the skills that you need to attract a highly targeted following on Instagram (which you can then sell to). This is a no-filler mastermind ( no sales pitch, just solid gold). AKA as much knowledge as I can cram into five weeks. There will be an opportunity to ask questions during the interactive weekly lesson. A safe space to get objective feedback from others for greater learning. Each week you’ll receive an actionable checklist that you can print off and keep. AND PDFs with bonus material in too! This can be completed in your own time around your other responsibilities. If it takes you longer than four weeks, that’s ok – you’ll have everything you need to complete the tasks on your own after the course is over. 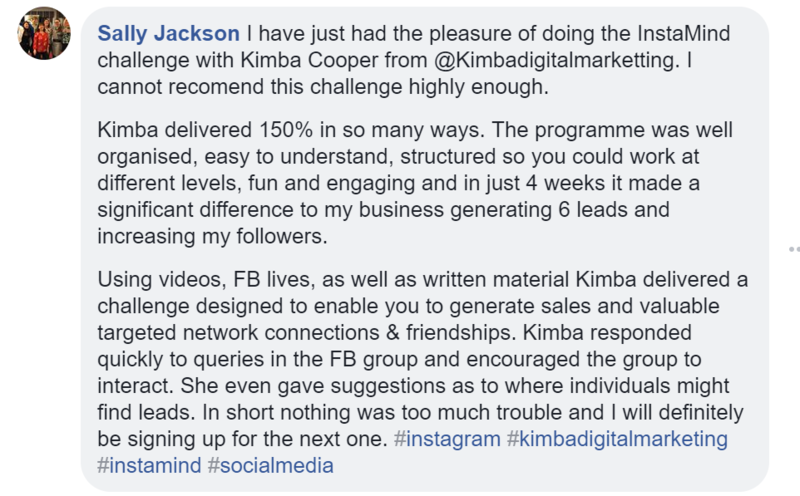 We’ll be going really deeper into each topic (including those covered in the 5-day challenge) – so that you can get even better results and a much clearer understanding of what you need to do to improve your following in a targeted way. You’ll generate loads of new followers on Instagram to get highly targeted prospects coming your way. You’ll increase engagement on your posts from your ideal client, potential collaborators and more. What could happen if you don’t do the course? 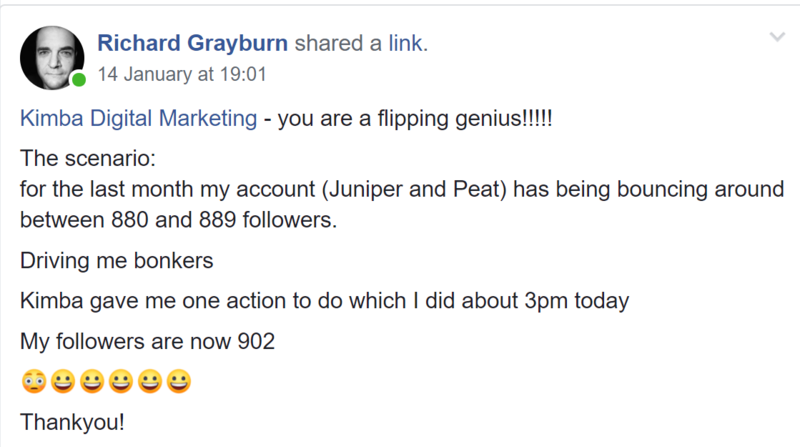 You’ll struggle to increase your following on your own – or only attract irrelevant accounts. You’ll lose the momentum you’ve built up during the challenge. 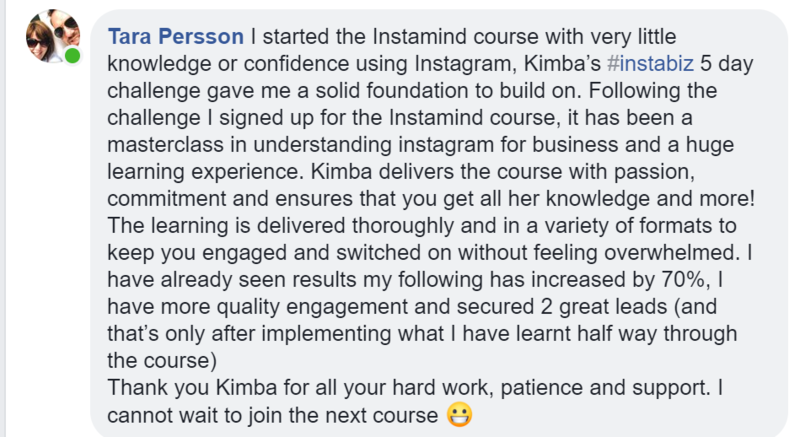 The 5-week InstaMind will start on 25th March and run until 26th April 2019 and is an investment of just £497. 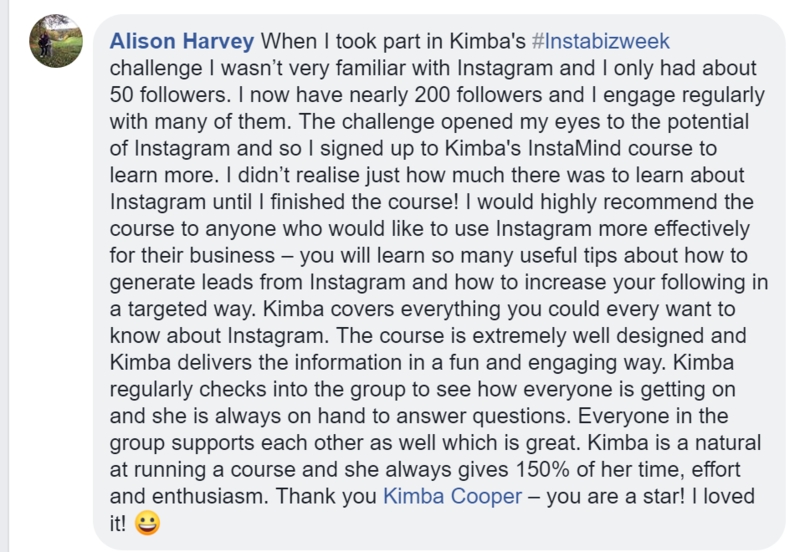 Any early birds who book before midnight on 17th February 2019 get an additional bonus of attending a 1 hour long webinar with Kimba with lots of valuable Instagram knowledge to get you started ahead of the mastermind. If you can’t attend the live webinar on Tuesday 5th March don’t worry – a recording will be sent to you. 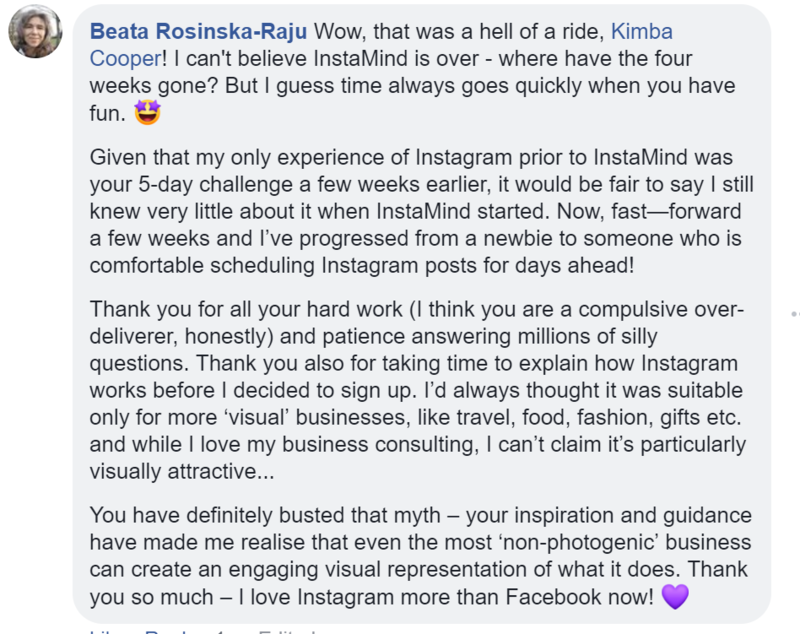 We ran our first ever InstaMind earlier this year and the results were incredible with people increasing their following, getting leads and making sales. Here are some testimonials …..